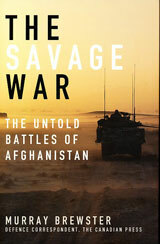 Brewster reported extensively on the war in Afghanistan for The Canadian Press news agency and documented the experience in his book The Savage War: The Untold Battles of Afghanistan. In the context of his first-person account of the mission on the ground and interviews with key people in Ottawa, he describes the domestic politics as toxic and divisive, and how different agendas drove Canada’s involvement. He discussed his book at the Fort Erie Centennial Library May 1. Afghanistan was a daily staple of news and discussion for eight years, and when the end of the combat role for Canadians was announced, domestic fatigue was replaced with almost total unconsciousness. Afghanistan society had been “shredded from 30 years of war” and Canada’s involvement was simply about “mopping up what the Soviet Union started” when it invaded in 1979. Following the withdrawal of Soviet forces and the collapse of the U.S.S.R., a decade of tribal fighting and civil war resulted in the ascension of the Taliban. Brewster said there is a divide among the people of Afghanistan. In the urban areas, people are more liberal and would like the country to develop and want the things that go along with that, such as electricity, clean water and jobs. The rural areas are where conservative religious ideals flourish and they support the Taliban or something like it. He said the ethno-cultural centrism of Western nations who believe they hold the moral high ground is “repugnant” to the people of Afghanistan. Certainly, Canadians did help by building schools and roads, but the prognosis for Afghanistan is not good. A domestic security force of 350,000 military and police personnel has been built, Brewster said, but the country cannot pay the $6 billion a year cost to support it when the total budget of the Afghan government is around $1.2 billion. Without ongoing financial support, the security force will fall apart and they will disperse — with arms and military training, he said.